Since it was founded years ago, Washington Apple Pi Labs has been guided by a very simple principle: stay on the very sharp, pointy edge of the cutting edge, preferably using someone else’s equipment. This frequently involves begging, but sometimes begging works. We asked, and someone actually loaned us a brand-new Power Mac G5 single processor 1.8 GHz computer. Yes, we were shocked, too. The first thing we noticed was the packaging. Remember the days when Apple shipped Macs in brown cardboard eco-friendly boxes with minimal printing and illustration on the outside? Those days are gone. 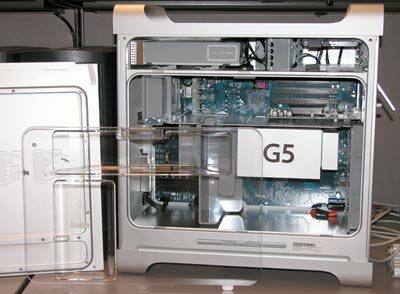 The Power Mac G5 ships in a big, black box with a full-size illustration of the gleaming aluminum machine found inside. This is both good and bad. Good: when the UPS or FedEx man comes by and drops one off, you immediately become the focus and envy of all sexes, including some sexes not immediately classifiable. Bad: shippers report that the Power Mac G5 has a fairly high theft rate, brought on by technolust and, at least in the first months, scarcity. Inside, the Power Mac G5 is nestled like a jewel, with all the various cables, and cords (and keyboard and mouse) neatly tucked away in foam compartments on an upper tray, and the Power Mac G5 cradled below. There is a presumably nice manual, but at Pi Labs we’re Mac people, so we don’t read no stinkin’ manuals. We haven’t a clue what it might or might not say since we wanted to preserve the swank shrinkwrap in pristine condition. Uncovering the G5, we gazed on it with tear-blurred love, and gently removed it from the box. That didn’t work, so we tried brute strength. This thing is a monster, at 39.2 pounds; it is virtually impossible to get it out of the box without someone holding the box down while another, heftier person lifts it out of its snug cocoon. Weight isn’t the only dimension of “bigness:” it dwarfs a Power Mac G4. A 1999 vintage Power Mac G4 tilts the scales at 28.7 pounds and stands 17” high and 18.4 inches deep; a Power Mac G5 is eleven pounds heavier and stands 20.1 inches high and 18.7 inches deep. Those who preferred to put a Power Mac G4 on top of their desks may find they have to re-think this choice with the G5, or get a bigger desk. The height also might present a problem if you want to put it under your desks, since there may not be enough clearance. On the other hand, it could make a cool room divider. Naturally, the first thing we wanted to do was look inside, so we removed the cover plate. Yes, it is a cast aluminum plate, and it feels like a piece of armor compared to the thin, light covers used on PCs or the plastic door on the Power Mac G4. You feel as if you could hold it in front of you in battle and bullets would bounce off, assuming you actually think aluminum armor is a good idea. The cover plate held an interesting surprise: there are diagrams, on the inside of the plate, showing how to remove and replace the transparent plastic air dam used to control airflow within the machine, plus the fan blocking the RAM sockets. Naturally, we didn’t pay attention to this until after we’d removed the air dam and fan, but since the process is pretty obvious no harm was done. The diagram could also come in handy if you were ever trapped in the machine and needed to know how to get out. We also couldn’t test the altitude rating (it works up to 10,000 feet; can we borrow a LearJet from someone? ), the temperature ratings (it works in areas with temperatures between 50 to 95 degrees Fahrenheit) or the 240-volt, 50 Hz electrical compatibility. Faced with such horrible barriers, there was only one thing left to try: speed. The G5 came with 512 MB of RAM and Mac OS X 10.2.7. The first thing we did after turning it on was launch every application on the computer, which proved less interesting than we imagined. Everything launched fine, but aside from launching faster than expected it wasn’t very remarkable. On the old, slow-to-wake-up Sony 17-inch monitor we used during testing, the screen was very cluttered, but we can clutter the screen on an older Mac, too. So we decided to download the ultimate test of computer horsepower: SETI@home (see sidebar). The SETI@home client is notorious for squeezing every bit of horsepower out of a computer, and starving all other applications. If SETI is running, everything slows down. We used SETI 3.0.8 for all tests. And our first test failed, sort of: we weren’t paying attention and downloaded the Mac OS 9 version and, when we double-clicked on the installer, Classic started. “Oh, %*@#&!” was the immediate response. Followed shortly by, “Oh. %*@#&!” You see, it’s like this: the Pi Labs gurus get annoyed if we launch Classic by accident, so on our machines we have checked the box in the Classic pane of System Preferences that says “Warn before starting Classic.” But this wasn’t our machine, and we hadn’t checked that box, so now we were forced to wait, and wait, and wait for Classic to start. We don’t like waiting. On a Power Mac G4 dual 1000 GHz machine, double-clicking on the Mac OS 9 version of the SETI installer brought up Classic in 68 seconds. On a Power Mac G4/400, it brought up Classic in 81 seconds. So here was our first accidental test result: you can launch Classic a heck of a lot faster on a G5. We later learned that the launch time was closer to ten seconds than six (more on that later) but it was still impressive. Recovering from this distraction, we downloaded the correct, Mac OS X version of SETI and installed it. There are two versions of SETI for Mac OS X: a command line version (boring, but fast) and a “GUI” version with the same graphical look as the Mac OS 9 (or Classic) version. We opted for the GUI version, and we also opted to run it as an application, not a screen saver (see sidebar). Some things to keep in mind: SETI is the client end of a valid, massive science experiment, and isn’t really supposed to be a benchmarking program. It also doesn’t produce consistent results; depending on the data it is processing, the time it takes to process a SETI work unit can vary from one work unit to the next. But it is also a nice, neat, pretty way to bring a computer to its knees, and it is free. We were impressed. While a Power Mac G4 with dual 1 GHz processors is not the fastest G4 ever built, it is still very fast, yet the single processor 1.8 GHz G5 was just short of twice as fast. Clearly, if you are looking for aliens, you’ll find them faster with a G5. In practical terms, this means the Power Mac G5 should excel at tasks that require floating point arithmetic. 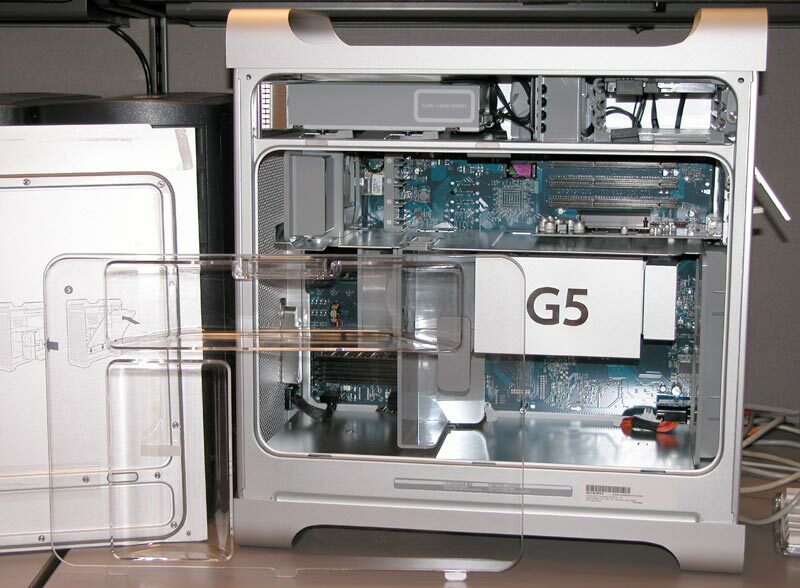 Mathematical modeling, CAD/CAM, and graphic arts all require very fast floating-point math, and at first glance, the Power Mac G5 is a winner, even when using software not specifically written for the G5. China’s Mao Zedong once said, “Let a thousand flowers bloom.” This pretty sounding phrase actually has a sinister history: Mao used it to launch China’s “Cultural Revolution,” a violent period in the nation’s history in which learning, education, culture and history were trashed and millions of lives lost, setting back China’s modernization efforts by a decade or more and doing irreparable damage to schools, libraries, museums and historic sites. But the phrase has great lyrical appeal, and has been modified by, among others, Rob Terrell, who wrote a simple program he calls Let1kWindowsBloom. 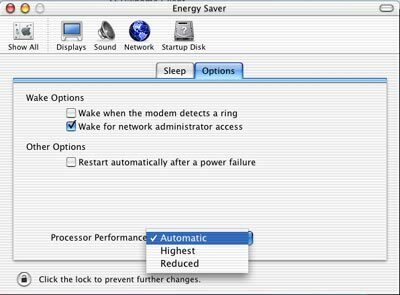 Rob noticed that he spent a huge amount of time every day opening and closing windows in Mac OS X, so he wrote a program to open up 1,000 windows as rapidly as possible. Since Mac users open a lot of windows, and since the program is free, it seemed like an ideal program for testing the G5. Unlike SETI , it can also provide results in seconds or minutes, instead of hours or days. A couple observations: first, the test results probably more closely reflect the speed of the video card installed than the speed of the processor, which is no great surprise. Second, the results varied. 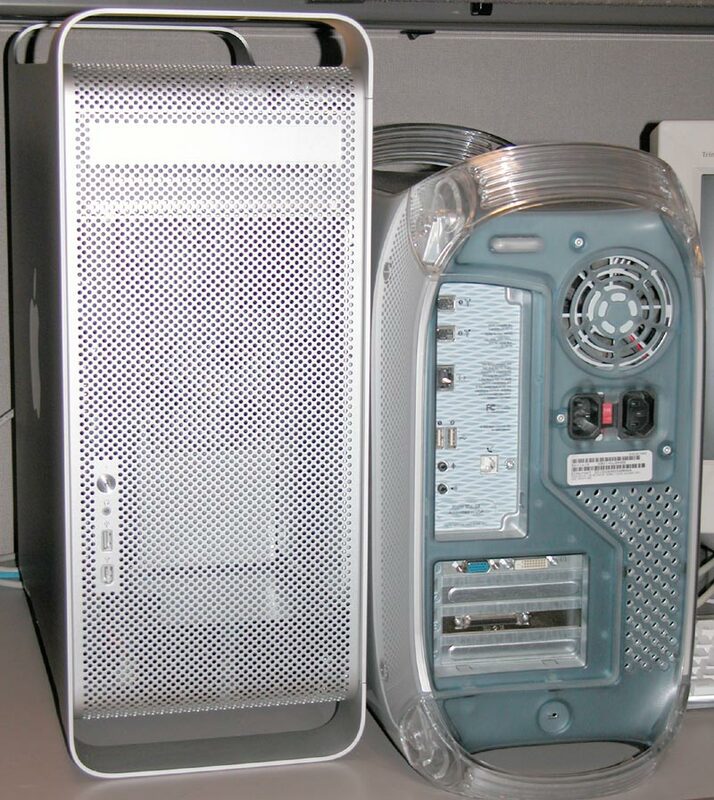 The Power Mac G4/466, for example, recorded times as slow as 96 seconds and, at other times, as fast as 89 seconds, and we couldn’t figure out why. Repeated tests performed at the same time, however, without rebooting or making other changes, were consistent. 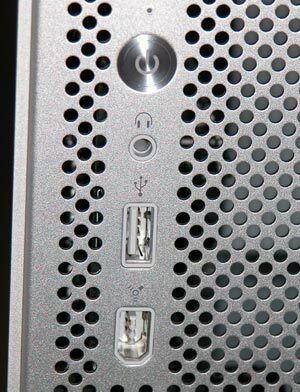 Quibbles aside: the Power Mac G5 eclipsed all the other machines. It was exactly twice as fast as the next fastest machine in this very simple benchmark. 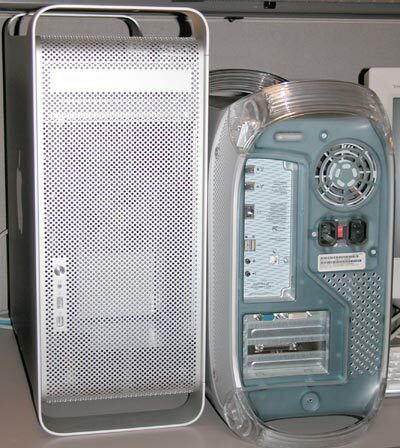 It just so happened that we were doing strange things with Web log files when the Power Mac G5 appeared. Web log files tend to be quite large, especially if you have busy servers, and we had a large mass of 313 log files, totaling nine billion bytes (9,145,309,400 bytes, to be exact). To make managing the log files easier, the logs are compressed using gzip, an open-source compression utility that ships with Mac OS X. To use it, you must open up Terminal and type in appropriate commands. This tells the Mac to display the date and time, right down to the second, then compress everything in the current directory (the * is a “wild-card” that means everything), and then display the date again. The semicolon is used to separate the commands. These times are actually quite impressive, for both the dual-processor G4 as well as the single processor G5. We were still amazed, however, that the G5 was fully two minutes faster at decompressing the files than the G4. At one point, some adventuresome soul installed Adobe Photoshop 7.0 on the G5, and then went to lunch. The rest of us, unaware the machine now had Photoshop, decided the G5 was a handy machine for duplicating some CD-ROMs. 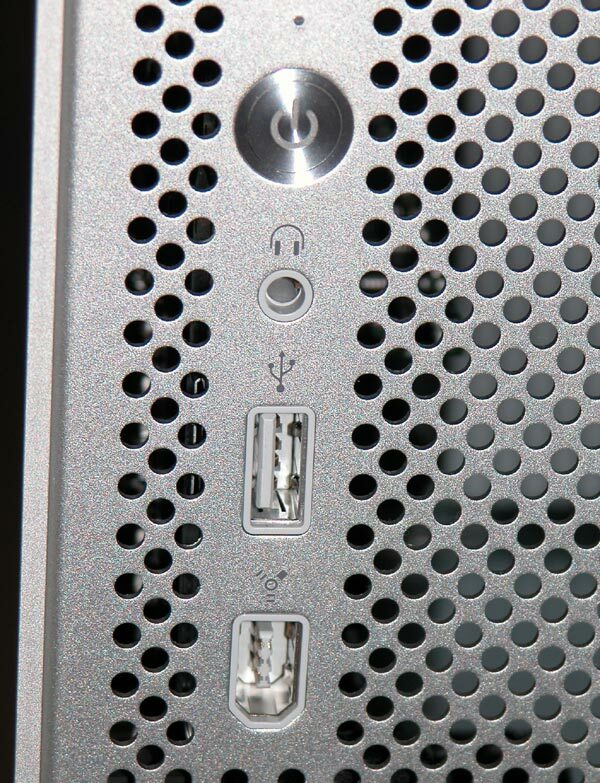 All Power Mac G5s come with a SuperDrive, and it burns CDs (and DVDs) faster than any previous Mac, according to Apple. So we first made some disc images, and then started duplicating them. At some point the wandering soul returned from lunch, and launched Photoshop. We immediately heard “oohs” and “aaahs” as they took large photos and did bizarre things to them. Suddenly, the drive door opened and a freshly-burned CD-ROM popped out. By the way: Apple is right. It does read and write CD-ROMs faster. We didn’t have a chance to check DVDs. By this time, we were beginning to get the impression that, although the Power Mac G5 is definitely fast, that isn’t the true strength of the machine. Yes, it is fast. But where it shines is in its ability to do multiple things at once, and provide enough horsepower to do them all -- fast. You really can have Classic running, find aliens with SETI@home, look up stuff on the Web with Safari, and do complex manipulations in Photoshop – at the same time. We were curious, so decided to do one more, very simple test: we’d fire up SETI on both a Power Mac G4/400 and the Power Mac G5. Then, while it was running, we’d launch Let1kWindowsBloom and see what happened. On the Power Mac G4/400, Let1kWindowsBloom took 141 seconds to complete with SETI running, compared to 85 seconds when Let1kWindowsBloom ran by itself. As expected, there was a spectacular slowdown. 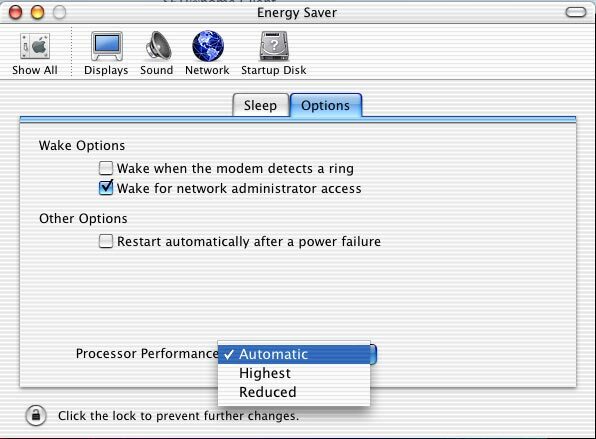 On the Power Mac G5/1800, the time was 22 seconds. Yes, with CPU-hogging SETI running in the background, Let1kWindowsBloom ran just as fast as it did without anything else running. We were out of time, and had to box the G5 back up. As a nice gesture, we decided to reformat the drive and reinstall everything so the owner didn’t regret loaning it to Pi Labs. All the software for the G5 comes on a single DVD, so reformatting and reinstallation was quite easy. Or so we thought. Nothing useful happened. Looking around, we discovered Classic was not installed. Instantly, visions floated through our minds of Pi Labs coming to a screeching halt, our reputation tarnished, our access to other people’s computers cut off, all because we couldn’t restore a brand-new G5 to pristine condition. Woe is we. Panic? Pi Labs panic? Of course we panicked! But then we looked at the DVD again and noticed there was another installer. We had selected “Install Mac OS X,” but there was also “Install Applications & Classic Support.” This second installer rapidly put things back as they were. We then clicked on the Classic version of the SETI installer and – Classic opened in ten seconds, not six. We need a bigger budget for memory, FireWire 800 devices, digital flat panel monitors and other goodies. We need a better monitor for testing. We were using an old Sony Trinitron that had great color, but it took about six or eight days to warm up. Tests were over often before the monitor was awake. The Power Mac G5 is big. And heavy. It is one big, hunking bit-bashing machine.